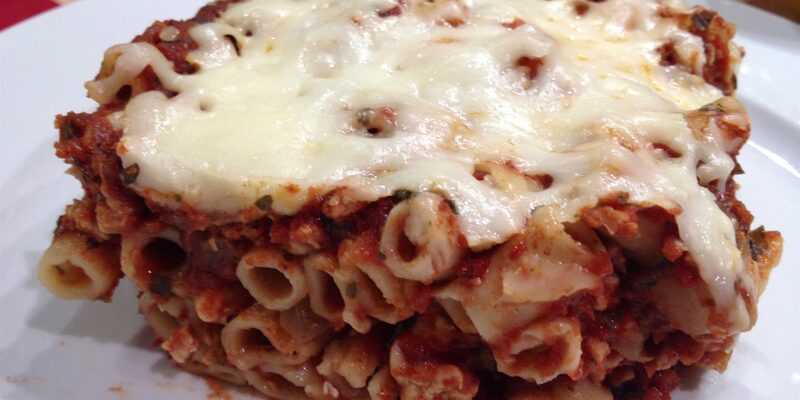 There’s a gluten-free baked penne recipe that takes less than an hour? Yep! You’ll need a decent sauce. If you make you’re own, that’s ideal. But if you don’t, no worries. There are some decent brands that aren’t packed with sugar and preservatives. I suggest starting with one of those. Check out my Best Brands List for some suggestions. Next, you’ll need a whole grain penne pasta. Again, feel free to check my Best Brands list for some great pastas. Remember, you’re looking for highest grams of fiber per serving. Those who eat gluten-free often can only find fiber servings up to 2-3g. But if you eat wheat, you can often find servings that contain from 5-8g of fiber. For the meat, you’ll need chicken or turkey burger – white meat! Then it’s all in the seasoning, so don’t be shy. Be shy on the cheese though, we want to keep the fat grams down. 🙂 The picture above uses the vegan rice mozzarella cheese. Heat a large fry pan on medium to medium high heat with the olive oil. Add the onion, parsley, basil, and red pepper flakes. Cook for 2-3 minutes. Add the garlic. Cook for 30 seconds. Add the ground meat and salt. Keep turning and breaking up the meat with a spatula as it cooks. Once your meat is cooked, and has started to brown in the pan along with the onions, add your 3 cups of sauce. Scrape up the brown bits into the sauce. Let the sauce come to a simmer. Taste and adjust your seasoning as needed. Add your 1/2 lb of pasta. Mix well. Transfer all ingredients to an 8x8 or 9x9 baking dish. Cover with foil (tent so the cheese doesn't stick). 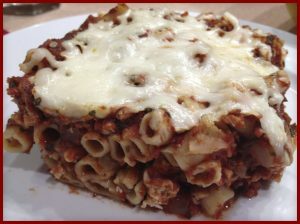 Bake in preheated oven for 30-40 minutes or until pasta is cooked and hot. Remove from heat and let set for 5 minutes. Try with my Lemon Garlic Kale!